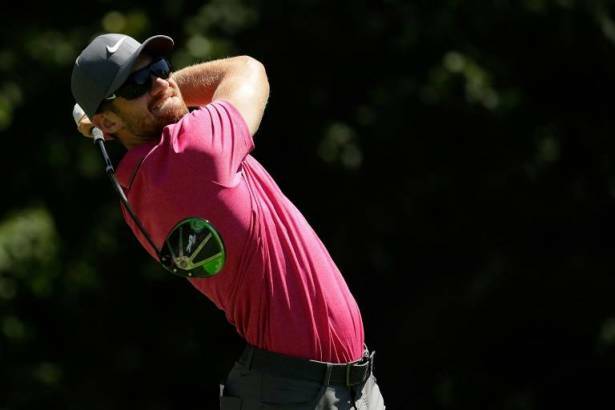 Patrick Rodgers fired a three-under par 68 on Saturday to maintain his two-stroke lead heading into the final round of the US PGA Tour's John Deere Classic in Silvis, Illinois. Rodgers had five birdies and two bogeys to build a 54-hole total of 16-under 197, two strokes in front of Americans Daniel Berger and Scott Stallings. Berger climbed up the leaderboard with an eight-under 63 that included nine birdies. Stallings carded a bogey-free 64 that included five birdies and an eagle to join Berger on 199. It was a further stroke back to American Nicholas Lindheim, whose second-straight 66 included five birdies and an eagle at the 17th, that was followed by his second bogey of the day at the last. Rodgers, who took the tournament lead with a seven-under 64 on Friday, birdied the second and seventh in the third round before giving a stroke back at the ninth. He rebounded with back-to-back birdies at 10 and 11 and added another stroke at 14 before a bogey at 15. Unfazed, he rolled in a 12-foot par putt at the par-three 16th, and shook off a poor drive to par the 17th. After closing with one last par, Rodgers said he wouldn't be tempted to play to protect his lead on Sunday, when he'll be seeking a first US PGA Tour title. With a win he would also earn the final berth in next week's British Open at Royal Birkdale. "This is a nice course to play with the lead because you have to keep the pedal down all day," the 25-year-old said. "Sixteen under is not going to win tomorrow. "So I need to go out and make a lot of birdies. It was nice to have that mindset today. "I didn't hit the best shots coming in, but they were aggressive at the flags and I'm going to stay that way tomorrow."